WASHINGTON, D.C.—Decked out in black tie and formal dresses, guests at Mr. Jefferson’s Capital Ball finished their salmon with horseradish sauce just as the band lured them onto the dance floor with classics including “Shout” and “My Girl.” Some of the people who paid up to $400 a couple to attend the event in the Grand Ballroom of the historic Mayflower Hotel joined in the Electric Slide. The ball was more than just another Friday night party to ease Washington into the weekend. It had the commendable purpose of raising money for scholarships to the University of Virginia. But not the kind of scholarships that go to low-income students based solely on their financial need. The proceeds from Mr. Jefferson’s Capital Ball are destined for merit aid for applicants who have the high grade-point averages and top scores on entrance tests that help institutions do well on college rankings. Merit aid can also attract middle- and upper-income students whose families can pay the rest of the tuition bill and therefore furnish badly needed revenue to colleges and universities. As institutions vie for income and prestige in this way, the net prices they’re charging the lowest-income students, after discounts and financial aid, continue to rise faster on average than the net prices they’re charging higher-income ones, according to an analysis of newly released data the universities and colleges are required to report to the U.S. Department of Education. This includes the 100 higher-education institutions whose leaders attended a widely publicized White House summit in January and promised to expand the opportunities for low-income students to go to college. In fact, the private universities in that group collectively raised what the poorest families pay by 10 percent, compared to 5 percent for wealthier students, according to the analysis by The Dallas Morning News and The Hechinger Report based on information the U.S. Department of Education released this month covering 2008-09 to 2012-13, the most recent period available. Not only did the White House pledge schools raise their net prices faster for the poorest than for higher-income families on a percentage basis, the new figures show; nearly a third increased the actual dollar amount more quickly for their lowest-income than their higher-income students. At the University of Virginia, for instance, the poorest students saw their net price climb $4,313 over that period, compared to $2,687 for students in the top earning bracket. “Institutions need to remain vigilant in making sure that the students with the highest need have the highest access to aid,” U.S. Under Secretary of Education Ted Mitchell said when asked about the disparity between the promises made by institutions and their real-world performance. The White House has scheduled a follow-up summit for Thursday on the issue of keeping college affordable for the lowest-income students. At the first summit, UVA President Teresa Sullivan was among the leaders who pledged to help poor families afford the price of college. From the start of the economic downturn through 2013, however, UVA raised the net price for its very poorest students by 69 percent, more than three times faster than for wealthier students, whose tuition increased 21 percent, the federal figures show. And even since January, beginning with the class that entered this fall, the public university dropped a policy of meeting full need for the lowest-income students without requiring them to take out loans and now asks in-state families to borrow up to $14,000 over four years and out-of-state families up to $28,000. 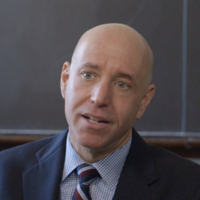 “All too many elite, extremely wealthy colleges and universities that should be operating as engines of socioeconomic mobility are instead calcifying inequality,” said Michael Dannenberg, director of higher education at the nonpartisan think tank The Education Trust. Colleges are required to annually report their average net prices—the total cost of tuition, fees, room, board, books, and other expenses, minus federal, state, and institutional scholarships and grants—to the Education Department. They must also break down those prices based on students’ family income, from the lowest—$30,000 or less—to the highest—$110,000 or more. There are limitations to the data. They cover only full-time freshmen who get federal grants, loans, or work-study jobs. The most recent figures cover the period ending more than a year before that January White House summit. And some schools dispute how net price should be determined and use their own calculations that are different from the federal formula. But the figures give the only available picture of what students from different income brackets pay to study at the same university or college. The data also make clear that, while lower-income students at many of the institutions represented at the White House summit still pay less than higher-income ones, their net prices are rising faster on an inflation-adjusted percentage basis than the net prices charged to students more able to pay. In some cases, costs for the wealthier families are actually falling. “There are powerful incentives for universities to avoid admitting and enrolling low-income students.” –Richard Kahlenberg, senior fellow, The Century Foundation. 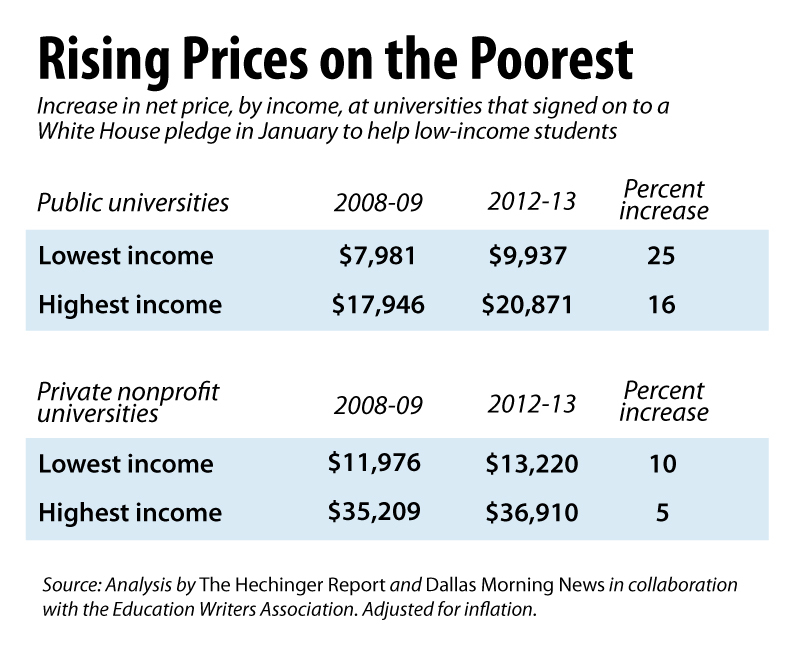 Even at the 36 taxpayer-supported public universities that signed the White House pledge, poor students paid an average net price of about $8,000 in 2008-09 and almost $10,000 in 2012-13. That’s a 25 percent increase. During the same period, wealthier students at those schools saw their average net price go from about $18,000 to $21,000, a 16 percent increase. The figures have been adjusted for inflation. Universities “are giving lots of merit aid to kids who don’t need it,” and less financial aid to those who do, said Richard Kahlenberg, a senior fellow at the nonpartisan think tank The Century Foundation. A UVA spokesman stressed that Mr. Jefferson’s Capital Ball is run by an independent foundation of alumni and other supporters, not by the university itself. He also said the elimination of the no-loan policy for low-income students was unavoidable because the cost of assisting them exclusively with grants had nearly doubled since 2008. Requiring all students to borrow is projected to save the university more than $10 million through 2018. “UVA has committed to providing the necessary need but also needs to ensure that the program is sustainable,” the spokesman, McGregor McCance, said. Heated protests over the changes, however, brought attention to the fact that, even as it was cutting the cost of providing financial aid to its poorest students, UVA was spending $12 million on a new squash facility and increasing its marketing budget by $18 million annually. Since then, a member of the Board of Visitors, Blue Ridge Capital president John Griffin, has pledged $4 million for scholarships for high-achieving low-income students and to seed an endowment for financial aid for top low-income undergraduates. A few other universities and colleges that were represented at the White House “Improving College Opportunity” summit said their net prices for low-income students appeared to be increasing more quickly than they really have because they use different formulas than the federal government does to calculate whether or not a student has financial need. For example, while the government takes into account only the income of the custodial parent in the case of a divorce, these colleges also factor in the income of the parent who does not live at home, and often the value of real estate and other holdings. This means they do not necessarily regard as low income the same students the federal government does, and may not provide them with much financial aid. That’s one reason Claremont McKenna College said it appeared to have more than doubled its net price for its poorest students—10 times as fast as for their richer classmates—in spite of also signing the White House pledge, spokesman Max Benavidez said. “Moving from one formula in reporting aid to another completely different methodological formula may account for the misimpression of a large increase,” Benavidez said, though he would not provide the formula the college uses. Another White House-pledge college that uses its own formula to calculate need, Oberlin, did provide specifics. 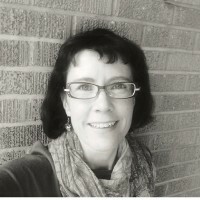 While federal figures show it doubled the net price for its poorest students at a rate 10 times as fast as for the highest group, Oberlin’s own calculations—which include the earnings of both parents in cases of divorce, making fewer students qualify as low income than the federal method—show that the net price for the poorest students hardly budged in the last three years and fell in 2012-13, said Debra Chermonte, dean of admissions and financial aid. Nor are seemingly wealthier families always necessarily able to afford tuition without help. Some may live in places with high costs of living, leaving them less disposable income, or have children close in age who go to college at the same time. “You might be making $200,000 a year, but you just got divorced and that’s a factor and this is a factor and there are other factors,” said Michael Crow, president of Arizona State University. Other universities and colleges at which the net price for low-income students has shot up faster than for higher-income ones conceded that financial aid based on merit, as opposed to need, is increasingly important to their bottom lines. Corredera said wealthier students, whose families can afford to pay at least some of the tuition, also subsidize financial aid for their poorer classmates. That subsidy is under attack in some states. The board of governors of North Carolina’s public universities, for example, is considering capping the proportion of tuition revenue that could be applied toward financial aid for low-income students, arguing that more affluent students shouldn’t be forced to cover the costs of their less affluent classmates. Iowa has already stopped its universities from using any of their in-state residents’ tuition toward financial aid. Cuts in state allocations for higher education have also reduced the money available for financial aid for low-income students, said some other public universities, including the University of Arkansas. 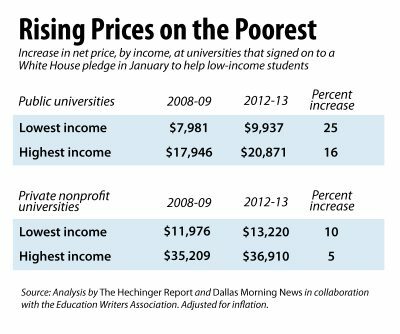 Yet the University of Arkansas raised its net price for the poorest families by 9 percent while lowering it 6 percent for wealthier ones between 2008-09 and 2012-13. The lopsided changes in cost there came even before the Arkansas State Lottery Scholarship was cut last year by more than 50 percent, said university spokeswoman Laura Jacobs, threatening to reduce even more funding reserved for low-income students. There’s at least one glimmer of promise for critics of current aid practices. As the heat on this matter is being turned up, states, on average, slightly increased the share of financial aid they allocated for low-income students, as opposed to other students, in 2012-13, the latest year for which that figure is available, according to the National Association of State Student Grant and Aid Programs. On the other hand, the inflation-adjusted total amount of aid declined. This story was produced by The Hechinger Report, a nonprofit, nonpartisan education-news outlet affiliated with Teachers College, Columbia University, in collaboration with The Dallas Morning News and the Education Writers Association.